The tables on the Risk Factor Overview present results from a series of observational prospective studies and one randomized controlled trial of postmenopausal hormone therapy (including estrogen alone or in combination with progestin) in relation to AD risk. Overall, in contrast to earlier systematic reviews and meta-analyses, the evidence from these studies does not support benefits on AD risk. 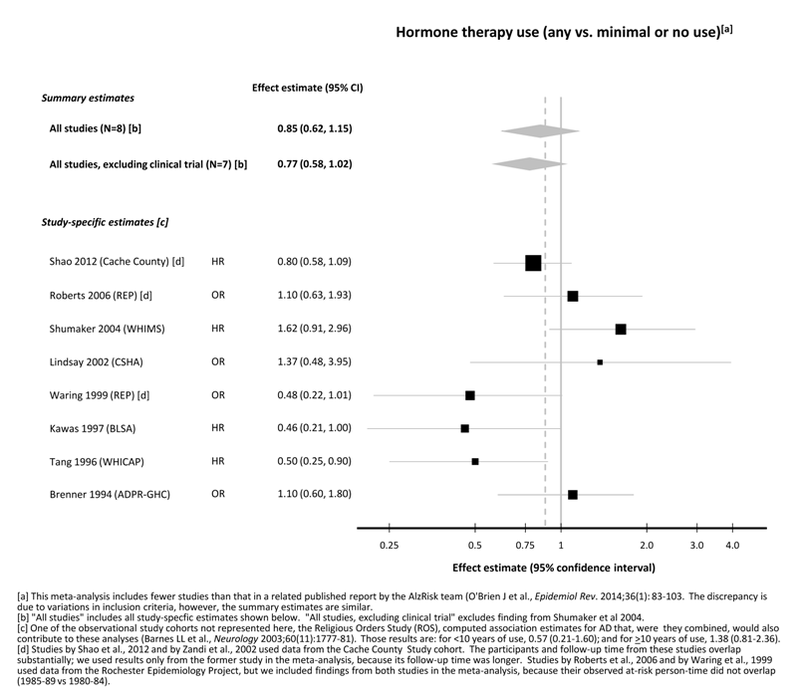 The relationship between postmenopausal hormone therapy and AD risk has been controversial; early observational studies, many of them retrospective, suggested a beneficial effect of hormone therapy, and randomized controlled trial results in postmenopausal women suggest that hormone therapy increases dementia risk, and also has adverse effects on other health outcomes. Confounding, as well as differences in the women’s ages, in the timing of use relative to menopause, and in hormone therapy formulation, may account for the disparate findings in earlier observational studies vs. subsequent clinical trials, but more recent observational studies suggest no benefit. Changes over time in the observational findings may be related to changes in hormone therapy use over time. In any case, estrogen remains one of the most effective treatments for relief from menopausal vasomotor symptoms, and, according to the North American Menopause Society, temporary use of hormone therapy may be appropriate to treat low-risk women with severe menopausal symptoms. For a discussion of the putative mechanisms by which hormone therapy may be related to AD risk and commentary on interpreting the findings below in a broader context, please see the Discussion. A longer review and discussion can be found in the closely related published review and meta-analysis, O'Brien J, Jackson JW, Grodstein F, Blacker D, Weuve J. Postmenopausal hormone therapy is not associated with risk of all-cause dementia and Alzheimer's Disease (Epidemiologic Reviews 2014;36:83-103). Please also see disclaimer for more information on these meta-analyses.